As active members of the Hispanic community, McDonalds makes sure to continuously serve the community by supporting events that make a greater impact on all present. 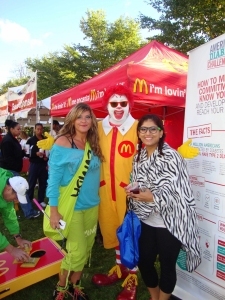 McDonald’s joined more than 3,000 residents at Grant Park to participate in the 5k American Diabetes Association (ADA) Step Out: Walk to Stop Diabetes in an effort to raise funds to find ways to stop diabetes. This year information was distributed about what McDonald’s is working to do as a leading brand in the food and restaurant industry to promote balanced eating and smart food choices. The Annual Latin GRAMMY ® Street Parties sponsored by McDonald’s paid tribute to Latin Music. The McDonald’s Hispanic Owner-Operators Association (MHOA) offered coupons for the new Chorizo Burrito and McCafé coffee. Ronald McDonald was also present entertaining the audience with his games and magic.